As Christians, why do we continue to sin? Do we take for granted God’s grace and kindness? Or do we so belittle our God, that we believe the consequences for our sins will never come? We do not live in a time when sins will be punished by the society (think the Mosaic law) immediately. We do not live in a time when sins will be divinely revealed by God, and people can be struck dead all of a sudden (think Ananias and Saphira). I’m sure if these things still happen, a lot of Christians will lead a more holy life. Yet at the same time, the motive might be purely out of fear, and not out of love. We all live on borrowed time. It’s like we’re already on death row, but thinking that the sentence is still far away, we continue to sin, and every Sunday we put on our good, Christian facade and go to church and ask for forgiveness secretly in our hearts. God will forgive us, won’t he? Of course he will, that’s what the scriptures tell us. True repentance will lead to actions – a concerted and committed effort to be rid of the sin completely. We may still struggle, but repentance isn’t about words. In this study we will examine the true nature of God’s kindness and mercy – not for us to continue to sin, but for us to repent. Or do you – Paul here, perhaps expecting an immediate objection to his somewhat harsh accusation in the previous verse – when you, a mere human being, pass judgment on them and yet do the same things, do you think you will escape God’s judgment? [Rom 2:3], for it would be easy to say, of course sins cannot escape God’s judgement, but I’m not that wicked, or I would have faced God’s judgement. 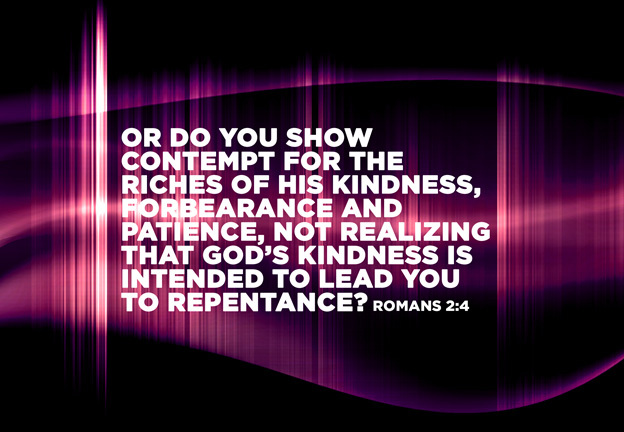 show contempt for the riches of his kindness, forbearance and patience – That objection-to-be was crushed when Paul points out that it was not because they weren’t that wicked, it was not because they didn’t sin, it was not because they were innocent that they didn’t face God’s judgement, and enjoyed prosperity – it was only because of the riches of his kindness, forbearance and patience. Indeed, if God were truly unkind, we would all have been dead, for the wages of sin is death [Rom 6:23]. If God so wished, he could have made our noses turn green everytime we told a lie, or have us struck by lightning everytime we commit a crime. Imagine you know you will lose a limb out of divine punishment if you bully your poor neighbour. Imagine you know you will have a heart attack if you make a dishonest income. If that happened, the world would be a tense and unfree one, but this argument would perhaps not have existed in the first place. It exists, because God is kind, God has a forbearance of divine proportions and God is enduringly patient. When we do not face judgement for our sins, it is not because we are innocent, but because God has shown mercy. not realizing that God’s kindness is intended to lead you to repentance – yet we as humans always take the kindness and grace of God for granted. We deny his mercy, and claim our own innocence, we reject his compassion, and persist in our sins, thinking that we’re justified in our actions. Often, we take verses like Romans 8:1 – therefore, there is now no condemnation for those who are in Christ Jesus – and run away thinking that it is our ticket to freedom, our freedom to sin. Paul addresses this mentality again in Romans 6:1 – what shall we say, then? Shall we go on sinning so that grace may increase? Should we continue on taking God’s kindness for granted and blind ourselves to the true purpose behind his forbearance of our sins? God is not patient with us so that we can continue in our sins. Instead, this kindness is meant to give us a chance, a second – or third, or whatever – chance so that we may repent and return to him as a better person, a better Christian. Every one of us will one day face God’s wrath. This is not speaking solely about the end of time. You do not know when God will pursue his justice. You do not know when God will reveal his wrath and fury. It could be anytime in this life and time that you are taking for granted for. God’s will isn’t for us to lead a sinful and perverse life. His will is for us to lead a life filled with the truth, filled with righteousness. While God is kind, has great tolerance and patience, we cannot assume it to be limitless. We cannot afford to test the patience of God by our reckless abandon of his word. Let us not treat God’s riches of kindness in contempt, but instead, treasure it and learn how to be blessed from it. Hey there! How’s it going? Have you graduated? Have you found a job? How’s your church doing? Hey Mike, it’s been a while! Yup, graduated; was a freelancer for the most part, and currently in the midst of forming a design company. Mainly doing web, print & interactive design. Church’s good, lots of changes in 2013, new leadership and fresh new start in 2014. I have been busy doing websites and internet promotion, more on the side of SEO than art and design. I have been teaching at our Christian high school and working to promote the school through the internet. Great to touch base with you! I feel guilty for being unattentive to the blog I launched with so much enthusiasm. God will make a way for you!